The first draft of the NRC is out. There were over 3.29 crore claims for citizenship and the government official could find out about 2.89 crore as authentic which means 40 lakh people face the sword of being ‘declared’ as illegal migrants or simply ‘Bangladeshis’. While the government has assured in Parliament that all care will be taken and people have a right to go to the tribunal and can file their documents, it is well known fact that this government was determined to bring the issue to create a permanent division between the people on the basis of their religion and ethnicity. Keep your finger crossed. 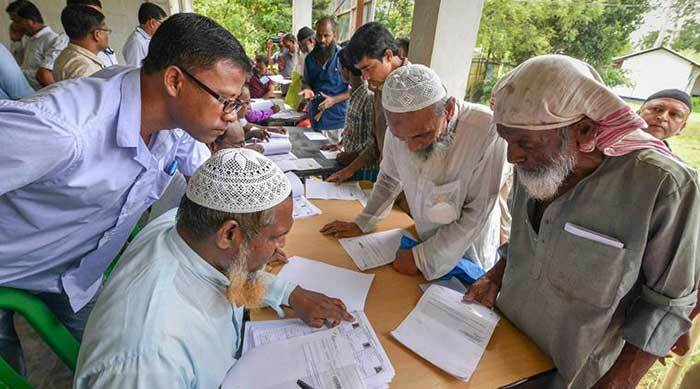 Like the poor, old, helpless were forced to stand in during the disastrous demonetisation, Assam’s Muslims will have to pass another test. Go to the authorities, stand in ques and prove that they are Indian citizens. No issue with National Register but problem is its communalisation and no direction of what happen if they are really illegal. We know it will not be easier for Bangladesh to say that they are their citizens. So what will you do in such circumstances ? Will the ‘detention camps’ become the other camp’s during the second world war ? We hope good sense will prevail. People of Assam should maintain peace and calm but also protest against the harassment of the innocents. As an alert citizens we must stand in support of our fellow citizens who are being divided and harrassed on the basis of their religious identity. Hope friends will approach Supreme Court for clear guidelines as well as what is the future of those who are declared as ‘illegal’ ? Which country will say that they are their citizens ? Look for some practical and pragmatic solutions and not merely your electoral victory alliances alone as nation is much bigger than your few victory or defeat. If the Honble Supreme Court has taken responsibility then it is duty of the Court to ensure that Genuine Indian Citizen irrespective of Caste, creed, ethnicity and Religion are not harassed or driven out from one state to another or to another Country. Indian Constitution gives guarantee and protection to any Indian to reside anywhere in India and Live and Work there — It should also control the political party not to deliberately exclude those People who have not voted for them..